First thing, try to narrow it down to 60 cards. You can have over 60 but it's best to have the bare minimum so you can get the cards you want. Secondly, more non-creature spells would do you good. Cards like Colossal Majesty and Nature's Spiral would be good for your deck (I'm pretty sure). The Colossal Majesty because you'll have a good amount of creatures with more than 4 power. Nature's Spiral for when you might need to get a big boy out of the graveyard. 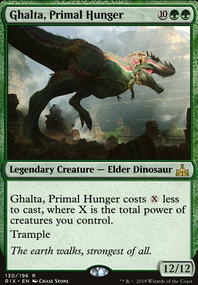 Ghalta, Primal Hunger would go good with Rhythm of the Wild . And then you have the classic Shock and Lightning Strike spells. 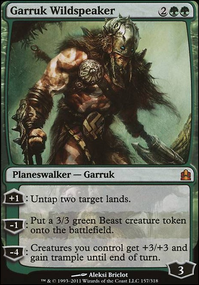 Another suggestion would be the new War of the Spark card, Ilharg, the Raze-Boar , for flashing out creatures like Impervious Greatwurm for some massive damage. These are just my suggestions, so heed them or ignore them, it's up to you. Yay mono green! My baby is similar to yours, though I like to run “fight” cards like Pounce , Rabid Bite and Nature's Way to get rid of bad creatures. 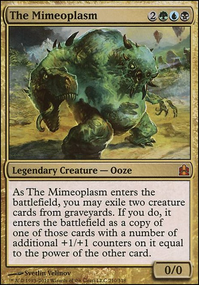 I’ve never been a fan of Impervious Greatwurm as it doesn’t even have Trample, so I use the pricier Kozilek, Butcher of Truth since it makes unprepared mill decks cry. AustinS on BLOOD FOR THE BOAR GOD!!! 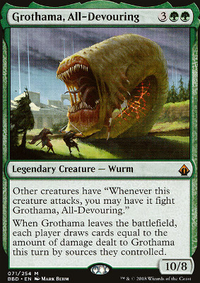 1) Replaced Wurmcoil Engine with Impervious Greatwurm as I believe it to be a better reanimation target. 2) Replaced Golgari Signet & Dimir Signet by Golgari Locket & Dimir Locket as I believe they are better. 3) Replaced Cancel with Thought Collapse as it fit the deck theme better. 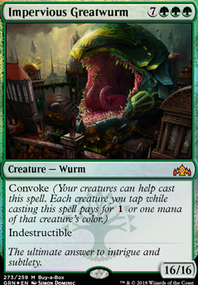 You should add Impervious Greatwurm it is the definition of a big green wurm. The deck hits really hard, nice on that. It is very weak to flying creatures and to board wipes. You should consider splashing red or black to get some interaction with your opponents and answers. Either Cindervines , Vraska's Contempt , Collision//Colossus (couldn't get it to link sorry), Midnight Reaper , Assassin's Trophy to name a few starters. I playtested against this deck a few times and consistently had problems casting Impervious Greatwurm . Something lower curve would be nice there, and splashing can get you the reaper mentioned or Gruul Spellbreaker which both add nice bonuses to your deck. 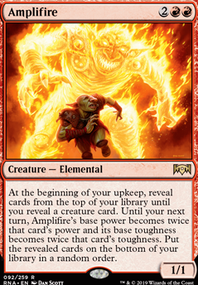 If you splash Red, Rhythm of the Wild is a great card to consider, allowing your big guys to hit right out the door instead of allowing your opponent to untap and hit them with removal spells. Overall I like where you are with this deck, but in this format, a splash adds a lot of strength. Good job. Impervious Greatwurm + Pariah / Pariah's Shield + Arcbond (targeting the Wurm) + any damage dealt to the Wurm. Arcbond will try to deal damage to you, but the Pariah effect will redirect it to Impervious Greatwurm . This will mean the Wurm has been damaged again, re-triggering Arcbond . This only goes infinite with an indestructible creature since it can stand being damaged any number of times.